...at the head of a long line of feasters sat a woodland king with a crown of leaves upon his golden hair, very much as Bombur had described the figure in his dream. Th elvish folk were passing bowls from hand to hand and across the fires, and some were harping and many were singing. Their gleaming hair was twined with flowers; green and white gems glinted on their collars and belts; and their faces and their songs were filled with mirth. The feasting people were Wood-elves, of course. These are not wicked folk. If they have a fault it is distrust of strangers. Though their magic was strong, even in those days they were wary. They differed from the High elves of the West, and were more dangerous and less wise. For most of them (together with their scattered relations in the hills and mountains) were descended from the ancient tribes that never went to Faerie in the West. There the Light-elves and the Deep-elves and the Sea-elves went and lived for ages, and grew fairer and wiser and more learned, and invented their magic and their cunnig craft in the making of beautiful and marvellous things, before some came back into the Wide World. In the Wide world the Wood-elves lingered in the twilight of our Sun and Moon, but loved best the stars; and they wandered in the great forests that grew tall in lands that are now lost. They dwelt most often by the edges of the woods, from which they could escape at times to hunt, or to ride and run over the open lands by moonlight or starlight, and after the coming of Men they took ever more and more to the gloaming and the dusk. Still elves they were and remain, and that is Good People. 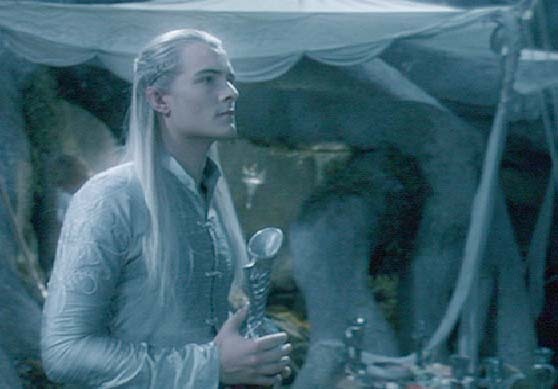 In a great cave some miles within the edge of Mirkwood on its eastern side there lived at this time their greatest king. Before his huge doors of stone a river ran out of the heights of the forest and flowed on and out into the marshes at the feet of the high wooded lands. This great cave, from which countless smaller ones opened out on every side, wound far underground and had many passages and wide halls; but it was lighter and more wholesome than any goblin-dwelling, and neither so deep nor so dangerous. In fact the subjects of the king mostly lived and hunted in the open woods, and had houses or huts on the ground and in the branches. The beeches were their favorite trees. The king's cave was his palace, and the strong place of his treasure, and the fortress of his people against their enemies. It was also the dungeon of his prisoners. So to the cave they dragged Thorn -- not too gently, for they did not love dwarves, and thought he was an enemy. In ancient days they had had wars with some of the dwarves, whom they accused of stealing their treasure. It is only fair to say that the dwarves gave a different account, and said that they only took what was their due, for the elf-king had bargained with them to shape his raw gold and silver, and had afterwards refused to give them their pay. 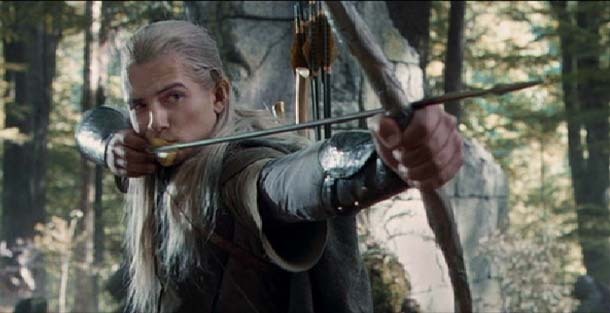 If the elf-king had a weakness it was for treasure, especially for silver and white gems; and though his hoard was rich, he was ever eager for more, since he had not yet as great a treasure as other elf-lords of old. His people neither mined nor worked metals or jewels, nor did they bother much with trade or with tilling the earth. This was the bridge that led across the river to the king's doors. The water flowed dark and swift and strong beneath; and at the far end were gates before the mouth of a huge cave that ran into the side of a steep slope covered with trees. There the great beeches came right down to the bank, till their feet were in the stream. Inside the passages were lit with red torch-light, and the elf-guards sang as they marched along the twisting, crossing, and echoing paths. These were not like those of the goblin-cities; they were smaller, less deep underground, and filled with a cleaner air. In a great hall with pillars hewn out of the living stone sat the Elvenking on a chair of carven wood. On his head was a crown of berries and red leaves, for the autumn was come again. In the spring he wore a crown of woodland flowers. In his hand he held a carven staff of oak. Companies of the Wood-elves, sometimes with the king at their head, would from time to time ride out to hunt, or to other business in the woods and in the lands to the East. One day, nosing and wandering about, Bilbo discovered a very interesting thing: the great gates were not the only entrance to the caves. A stream flowed under part of the lowest regions of the palace, and joined the Forest River some way further to the east, beyond the steep slope out of which the main mouth opened. Where this underground watercourse came forth from the hillside there was a water-gate. There the rocky roof came down close to the surface of the stream, and from it a portcullis could be dropped right to the bed of the river to prevent anyone coming in or out that way. But the portcullis was often open, for a good deal of traffic went out and in by the water-gate. If anyone had come in that way, he would have found himself in a dark rough tunnel leading deep into the heart of the hill; but at one point where it passed under the caves the roof haed been cut away and covered with great oaken trapdoors. These opened upwards into the king's cellars. There stood barrels, and barrels, and barrels; for the Wood-elves, and especially their king, were very fond of wine, though no vines grew in those parts. The wine, and other goods, were brought from far away, from their kinsfolk in the South, or from the vineyards of Men in distant lands. To the Elvenking he [the Dwarf Bain] gave the emeralds of Girion, such jewels as he most loved. "Farewell! O Elvenking!" said Gandalf. "Merry be the green-wood, while the world is yet young! 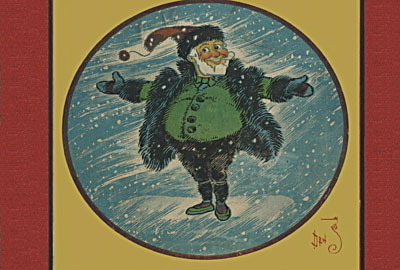 And merry be all your folk!" "Farewell! O Gandalf!" said the king. "May you ever appear where you are most needed and least expected! The oftener you appear in my halls the better shall I be pleased!" "I beg of you," said Bilbo stammering and standing on one foot, "to accept this gift!" and he brought out a necklace of silver and pearls that Dain had given him at their parting. Then the elves turned toward the Forest, and Bilbo started on his long road home.